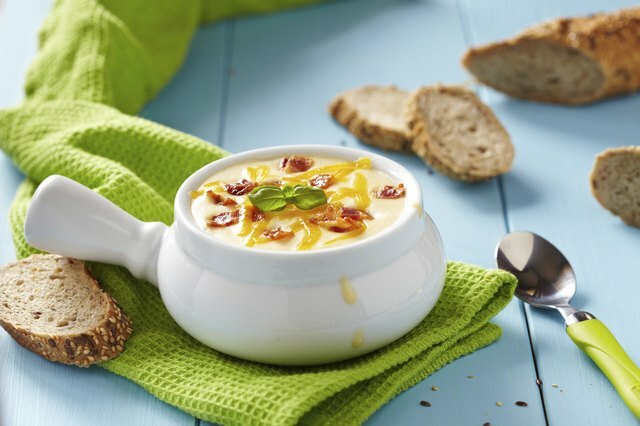 Creamy and comforting, a bowl of potato soup is just the dish to sit down to when there’s a chill in the air. Baking the potatoes beforehand adds robustness and lends a hearty texture to the resulting soup. Inspired by the simple Baked Potato Soup from "The Joy of Cooking" by Irma Rombauer, Marion Rombauer Becker and Ethan Becker, green chilies and red pepper flakes add a Tex-Mex flair to this hearty potato soup. Serve with garnishes to add pizazz to your bowlful. Cut the baked potatoes in half and use a spoon to scoop the cooked potato out of the skin. Bring a large pot to medium high heat. Add butter or bacon fat and let it melt. Add the onion and garlic to the pan and cook for 8 to 10 minutes, stirring frequently, until the onion has softened and turned slightly translucent. Pour in the can of diced green chilis and stir to combine. Follow with the chicken broth, baked potato, red pepper flakes, and a few dashes of salt and pepper. Bring the pot to a boil, and then reduce heat and simmer for 10 to 15 minutes. Use a potato masher to gently mash the potatoes into the soup if you’d prefer a less chunky consistency. Reduce the heat to low. Pour in the heavy cream, stirring gently to combine. Whisk in the sour cream until fully incorporated. Remove your soup from the heat and spoon into bowls. Garnish with bacon crumbles, chives and shredded cheese. Make it meaty. Sausage and shredded chicken complement the hearty creaminess of potato soup. Eat your veggies. Sneak in vegetables like shredded carrots, green beans, spinach or corn. Season it to your liking. If spice isn’t your thing, leave out the red pepper flakes. Fresh or dried herbs such as basil and oregano give potato soup an Italian edge. Cumin and paprika add subtle smokiness and ranch seasoning is a guaranteed crowd-pleaser. Reduce the calories. Swap out the heavy cream for skim milk and use low-fat sour cream to lighten the calories. Make it vegetarian-friendly. Use vegetable stock instead of chicken and leave out the bacon crumbles. Potato soup is a great way to use up leftover baked potatoes prepared the previous evening. If you don’t have time to bake your potatoes beforehand, simply peel and dice them into roughly 1-inch cubes and simmer until soft, around 15 to 20 minutes. Mash the potato cubes to break them down into smaller chunks or use an immersion blender to incorporate the potato into the soup if you would like.